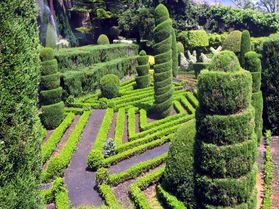 In classical Latin, opus topiarium was the general term for ornamental gardening. Gradually, topiarius became the prestigious title of a gardener whose specialty was the carving of trees and shrubs. 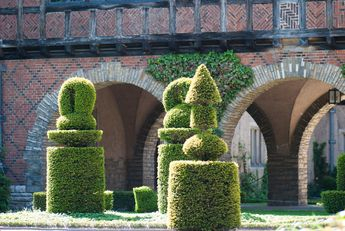 Today, topiary can refer to any plant, indoors as well as outside, that has been coaxed into a decorative form. Training ivy onto a wire frame is an easy way to create a simple topiary. English ivy, Hedera helix, is a common indoor plant that is often used when creating topiaries. It comes in a variety of leaf forms and colors, from plain green to variegated. While the variegated forms grow more slowly than the plain green varieties, almost any type can be used to create your topiary. 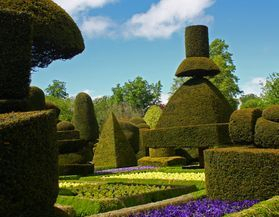 Topiary is an art form. Creating a simple wire form can take less than an hour. However, patience will be required as it may take a year for your ivy to grow and cover the form. 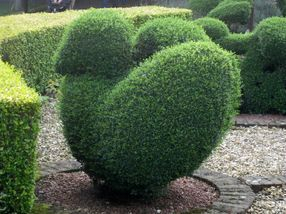 The shape of your topiary is only limited by your imagination. Some common forms are the wreath, cone and single or double ball. Make sure that you use sturdy wire and that the legs of the wire form are long enough to reach the bottom of the pot. Simply plant your ivy at the base of the wire form and train the ivy over the form. Weave the ivy back into the frame to create thickness or to cover bare spots. Prune and pinch your ivy regularly to encourage the plant to produce more growth from within the plant. Water your ivy when the soil is dry to the touch. Water the plant thoroughly, let it sit, and water it again. Misting may help keep the plant clean, but it will do nothing for the soil or the plant's needs. Dry areas are a problem for ivy; placing the ivy topiary on a bed of pebbles in a tray will help increase the humidity. Always allow good drainage for the topiary; over watering can cause wilting and leaf damage. Ivy topiaries are designed for indoor use with a temperature range of 60 to 75 degrees F. You may bring your ivy outdoors in these temperatures, always keeping it in the shade. 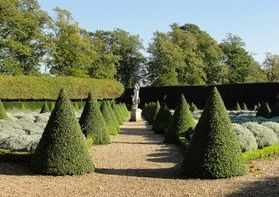 Protect the topiary from frost, hot air blowers, vents and heaters. Fertilize the topiary with a general houseplant fertilizer about every three weeks. In the winter, monthly fertilization is adequate. Keep your ivy in indirect bright light. Direct sun is harmful and will cause leaf damage. For a fuller plant, rotate the ivy when the leaves begin to face the light source. Ivies, as compared to many other ornamentals, suffer from relatively few pest problems. Most pest problems in the home can be prevented or controlled by periodic washing, or by spraying the plant with a general purpose insecticide. Washing removes dirt, dust, and insects. Frequently dunk the foliage in a gallon of water to which a few drops of dish washing detergent have been added. The most common ivy ailment is spider mite infestation. Spider mites thrive in the warm, dry home environment. Spider mite damage is recognized in the earliest stages by pinpoint yellow speckles toward the base of the stems of older foliage, and webbing between leaves, which then turn yellow. In advanced stages the webs develop over the leaves and stems, and leaves become brown, shriveled, and dried out. Once insect or disease damage has occured, damaged tissue cannot be healed. Cut off insect infested parts of the plant, and remove dead leaves to prevent the spread of disease. Ivies grow quickly and will soon fill in the bare spots.